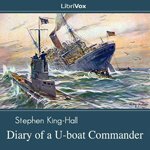 Stephen King-Hall, a Royal Navy officer during the war and writing as “Etienne”, penned this book as if he had simply discovered it on a surrendered submarine. In fact, some editions of the book list the author as “anonymous.” King-Hall’s knowledge of naval affairs lend authority to this yarn of men that go to the sea in ships that sink… on purpose. (Summary by Mark F. Smith). My Recommendation: Mark Smith, a veteran of many, many Librivox recordings once again does a premier read of an entertaining story.